The bathroom is a vital space in any house. It is the most frequented room after the kitchen. Also, a bathroom says a lot about you as the homeowner. Therefore, it is crucial to ensure that you have a functional and modern bathroom. But if you have the best bathroom now, there is no guarantee that it will stay that way for a lifetime. It is because a bathroom gets a lot of abuse and so there will always be parts that need your attention. For example, over time, the worn-out bathroom tiles will be slippery which is very dangerous to the users. In this case, you need to replace the tiles to keep your bathroom safe. Keeping your bathroom safe and in good condition calls for regular bathroom improvements. Renovations range from simple changes to significant changes, i.e., a bathroom extension. The significant changes will cost you a fortune so it would be best to leave them to the experts. However, if you are working with a budget, there are a few DIY bathroom renovation ideas that you can use to modernise your bathroom. This article will highlight a few DIY ideas that will add value and functionality to your bathroom. Contrary to other people’s opinion, you do not have to change your bathtub or replace the bathroom tiles to make an impact. There are some subtle modifications you can implement in your bathroom which can have a huge impact. For example, a paint job will add value and appeal to your bathroom. Over time, your bathroom colour will fade away and become unattractive. You can always restore the condition on your own by doing a paint job. All you need is to know the right colour to buy and how to mix the colours to bring out the best look. Building a smart, chic shelving unit to keep unsightly bathroom accessories. 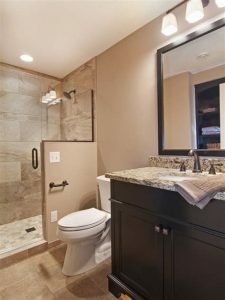 The secret to a successful DIY bathroom renovation is knowing what your bathroom needs, working within the budget available and then considering the things that you can accomplish on your own. Avoid working on complex bathroom improvements as this will end up costing you more; don’t take the risk, hire a professional bathroom renovation builder instead.